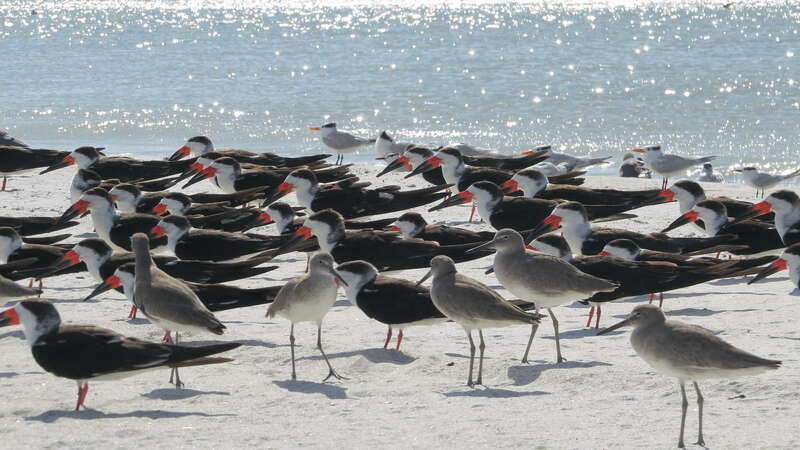 My family has timeshare at a condo at Madeira Beach and I returned this year to spend time with them and check out the birds. 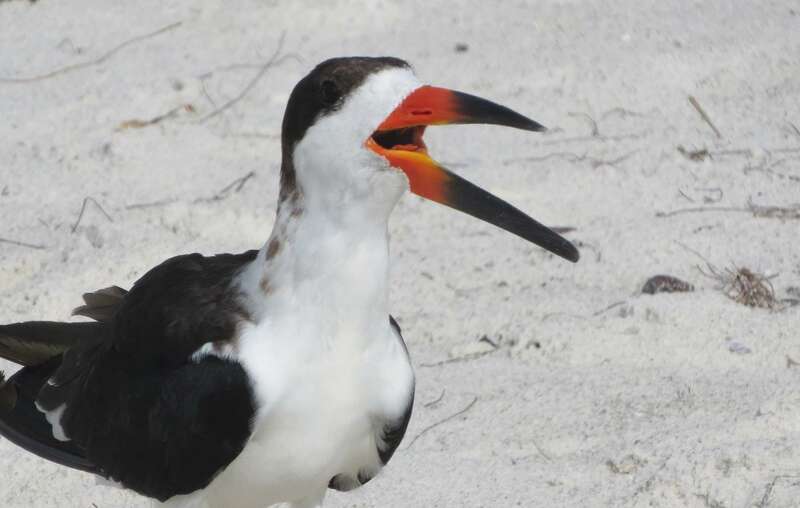 Two years ago I remembered a large flock of resting birds on the beach right in front of the condo that included Black Skimmers that totally blew my mind. I was so happy to revisit these charismatic birds. 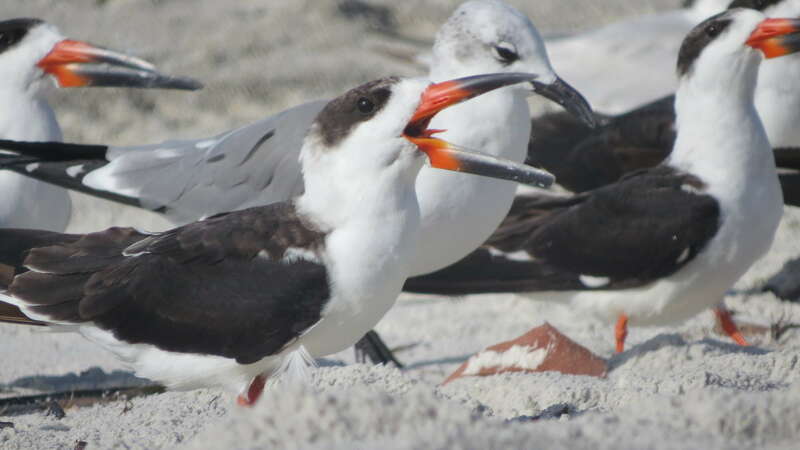 Having two more years of birding under my belt, I felt I had a better grip on shorebirds, terns, and gulls. It felt really good to apply what I’ve learned as I scanned the flock, focused on field marks, and looked for the differences. 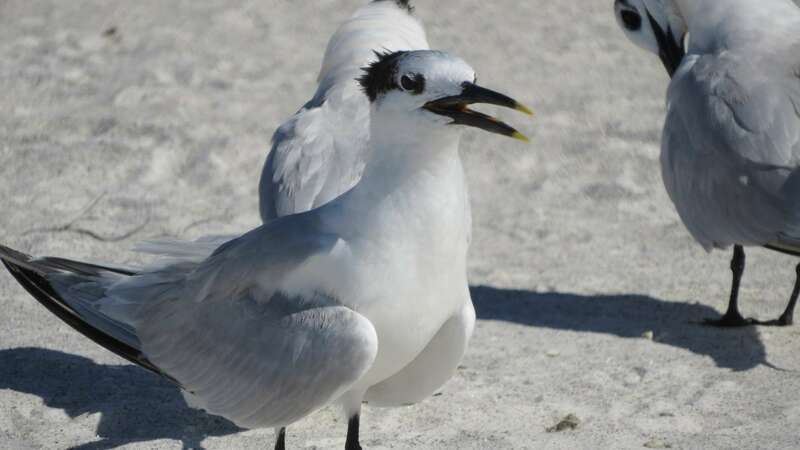 If your bill looks like it was dipped in mustard, you’re a Sandwich Tern. 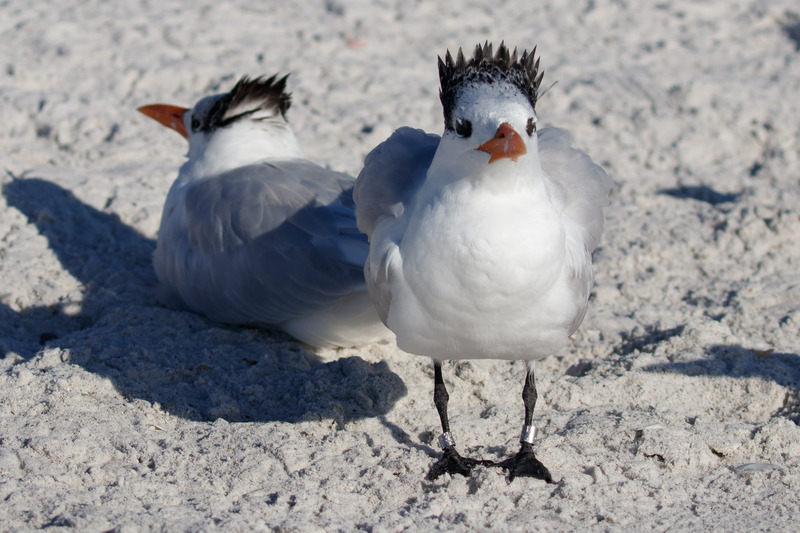 If you’re balding except for those Bart Simpson spikes in the back, you’re a Royal Tern. 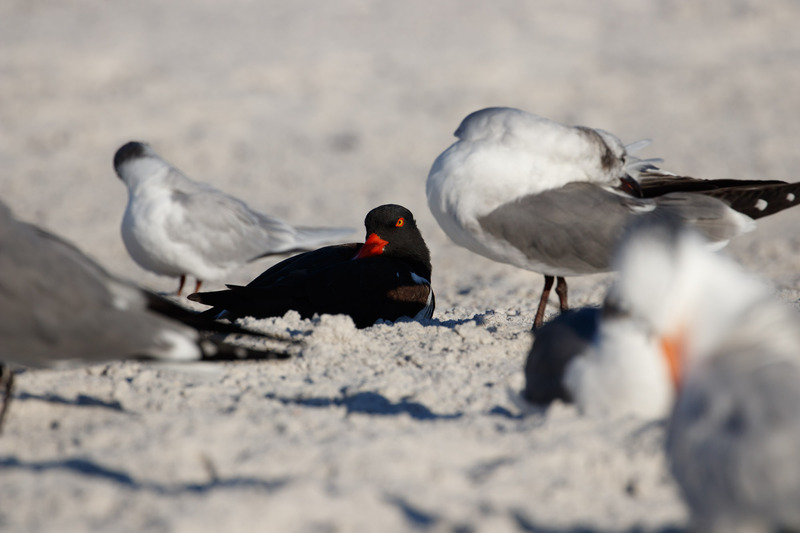 I haven’t thought of anything clever for the Forster’s Tern, so if you’re a small tern leftover with a dark comma by the eye and orange legs you’re a Forster’s Tern. 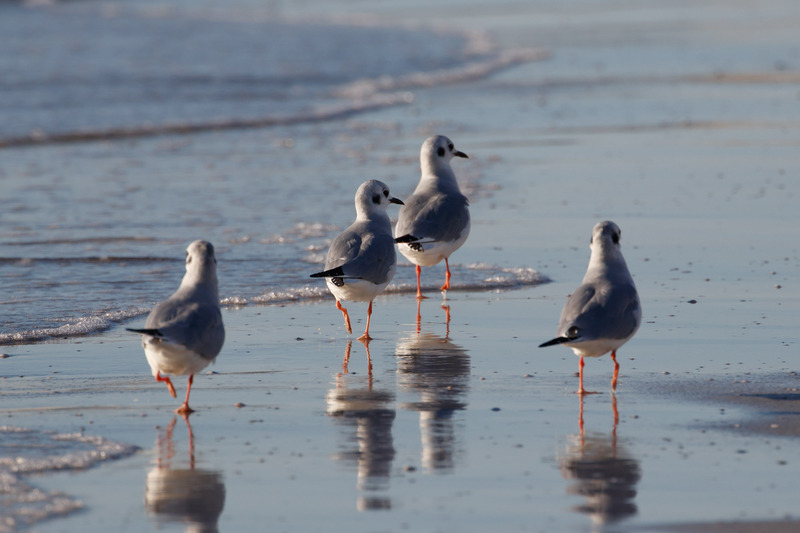 As were effervescent Laughing Gulls. And the first day I saw a rather large gull that stood out in the flock. That dark back, light eye, the stern look. It was almost like a Herring Gull but the back was too dark. 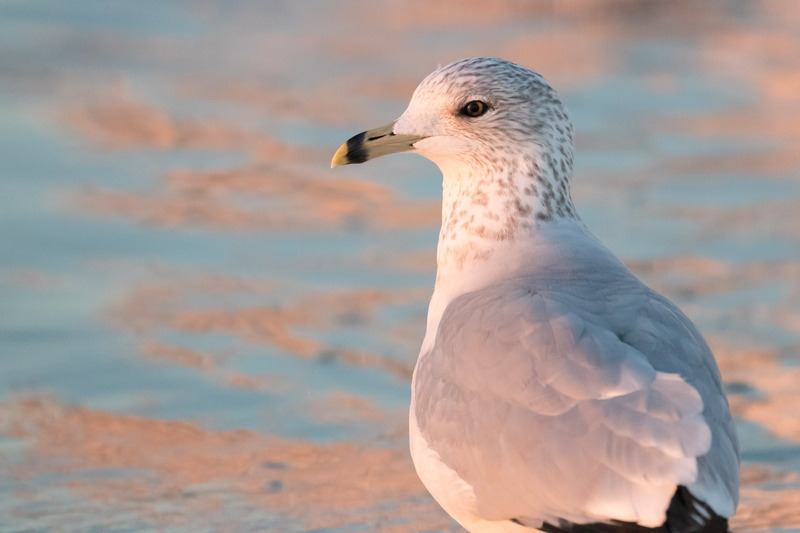 Hopeful, I looked up black-backed gulls and this one fits perfectly with Lesser Black-backed Gull. 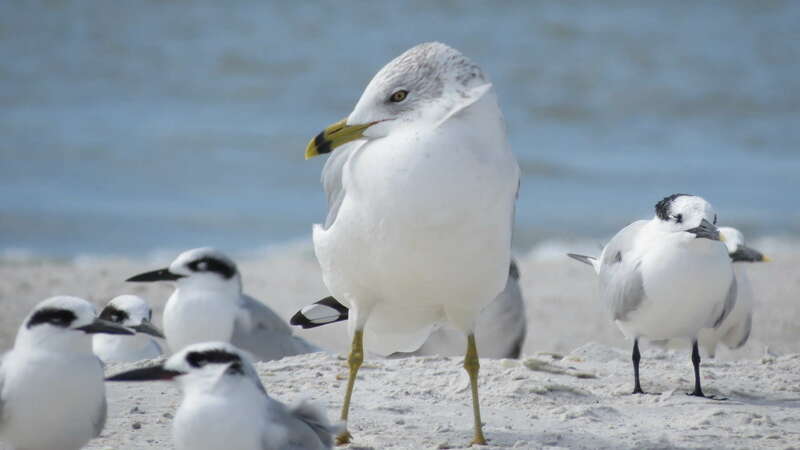 Identify-new-gull achievement unlocked! 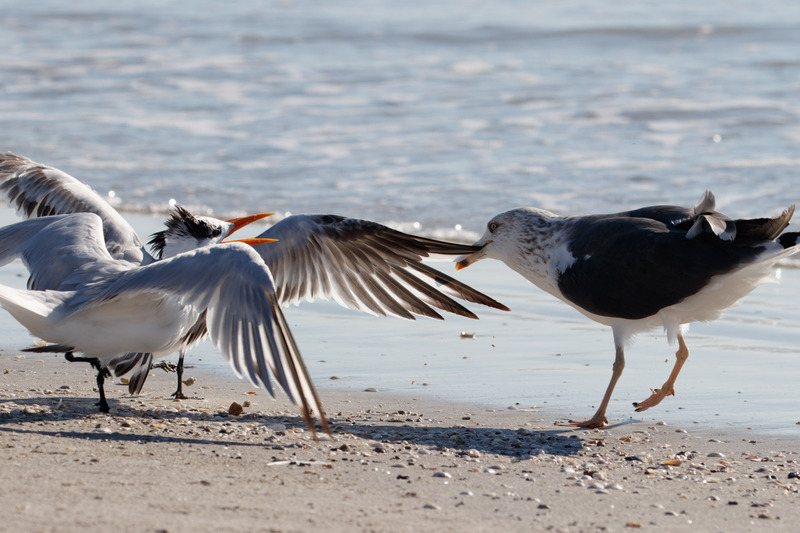 The Lesser Black-backed Gull had a bully persona to go along with that stern look. 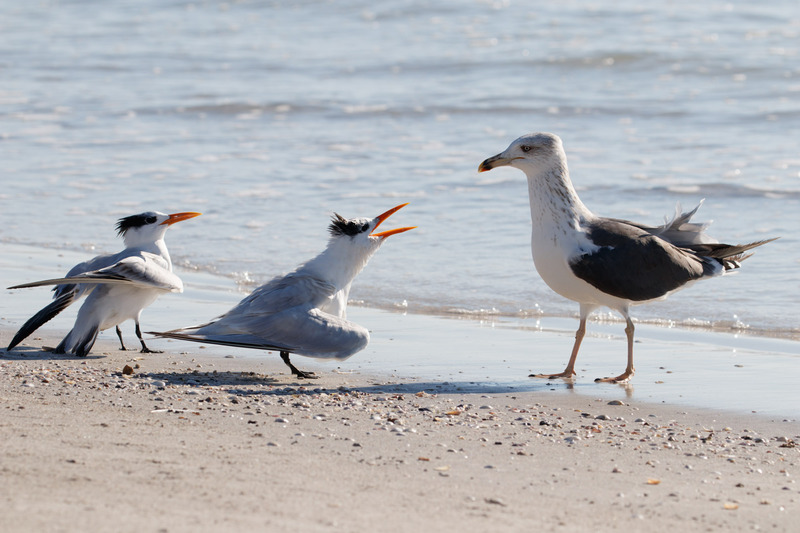 The terns weren’t as thrilled as I was to have it around. 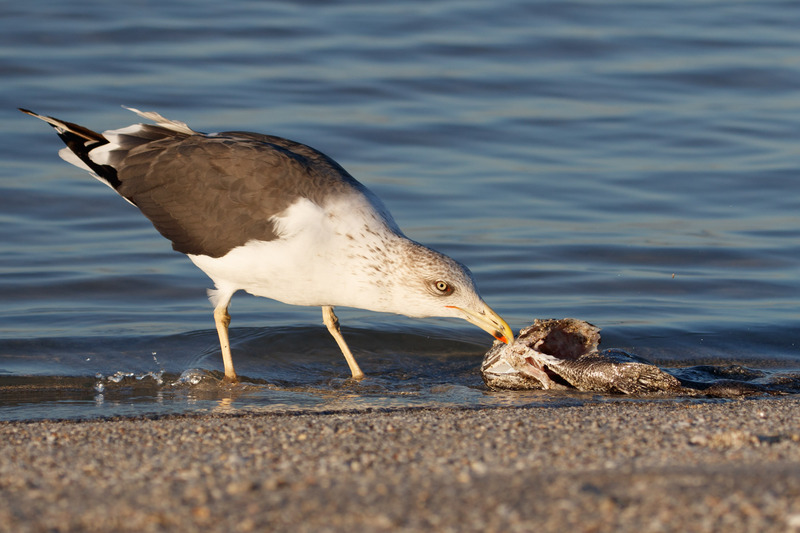 To me the Lesser Black-backed Gull looks like a gull that’s been up all night drinking. He’s tired, cranky and means business. The beach rewarded me with something different each day. Last time I found one Red Knot, this time I found a whole lot of knots. 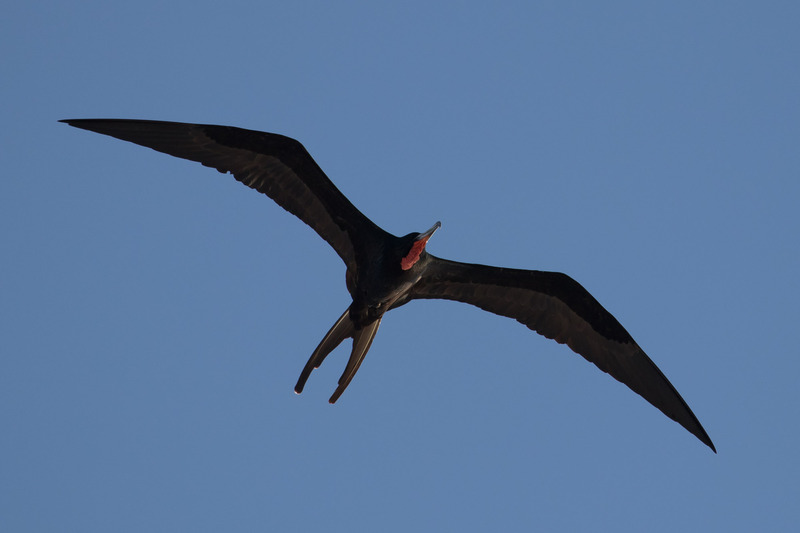 Late afternoon one day as I went for a swim with my mom and aunt in the gulf, almost as soon as I entered the water (and acclimated to the chilly water temp) I looked up high in the sky and thought I recognized the shape of a Magnificent Frigatebird. I’d hoped to see one on the trip, but this was terrible timing! Not wanting to miss the photo opp I awkwardly splashed out of the water, ran all the way back up to the room grabbed my camera, and hurried back to the beach to snap a few pics. 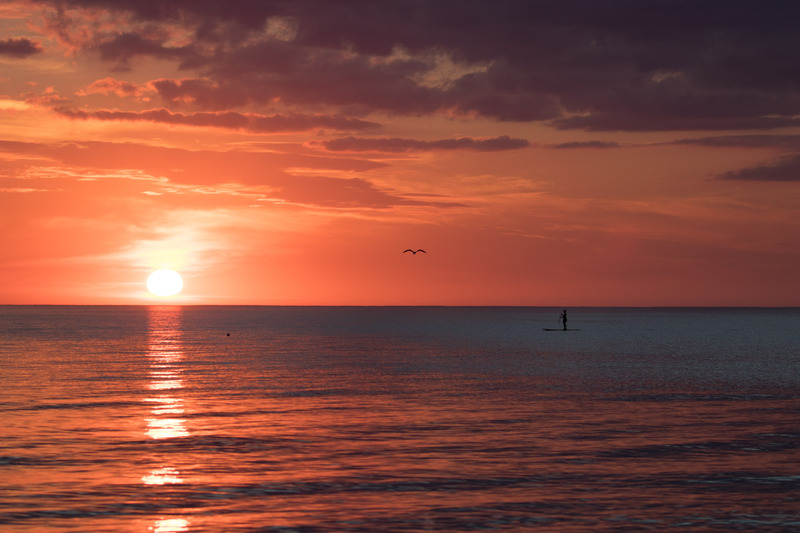 Then it was back to the room to drop off the camera, back to the beach and into the waters again to relax and swim. It was totally worth it. 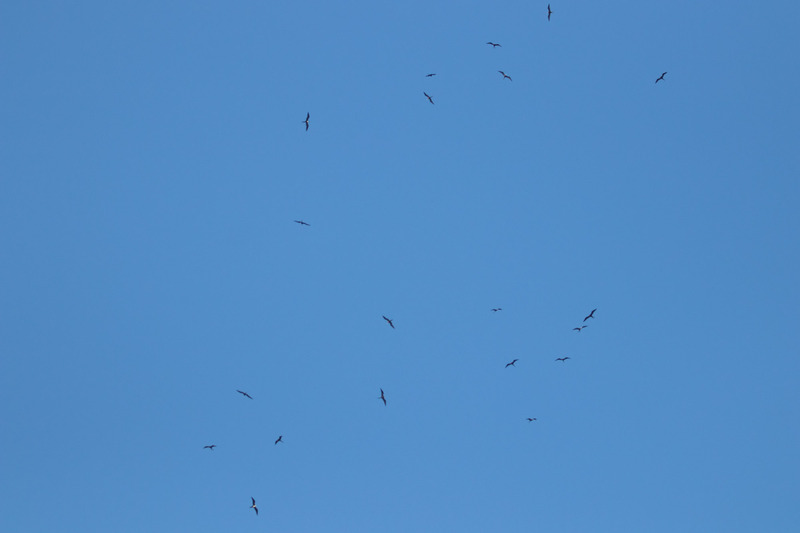 It wasn’t until later that I noticed even more frigatebirds in the sky. First there was one, then a few, and suddenly a dozen. 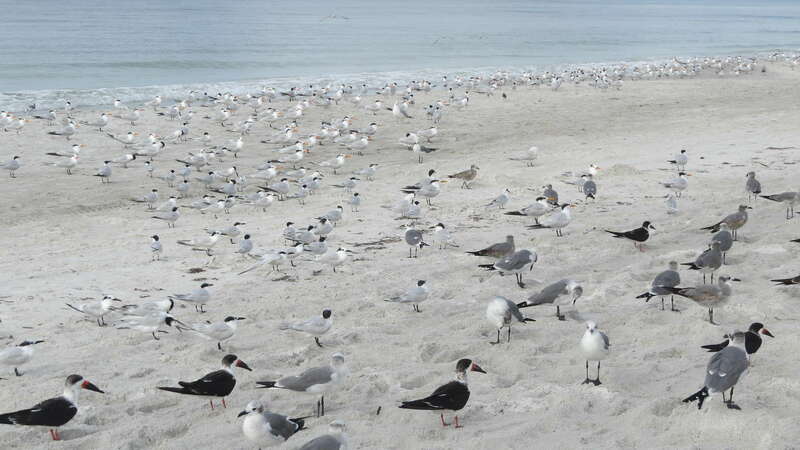 Later, while my mom and I visited the Seaside Seabird Sanctuary down the street I looked up and counted 28! I managed to get 20 in one photo. Crazy. 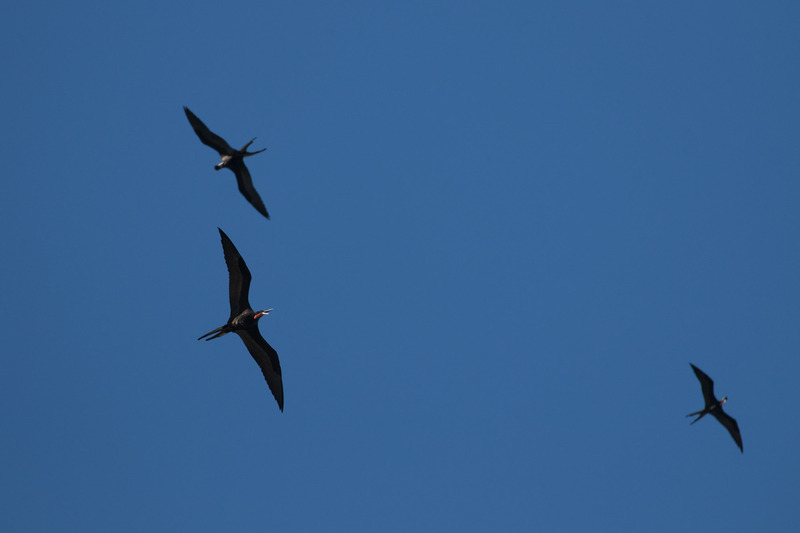 It was some kind of frigatebird meetup (my aunt called them “friggin birds” by then). Back to the Seabird Sanctuary (an awesome place! 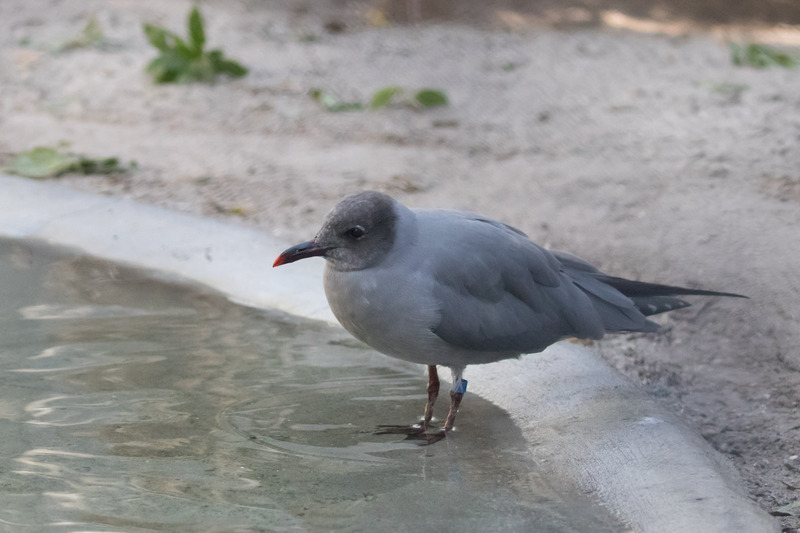 ), bonus points to anyone who can identify this handsome gull housed there. 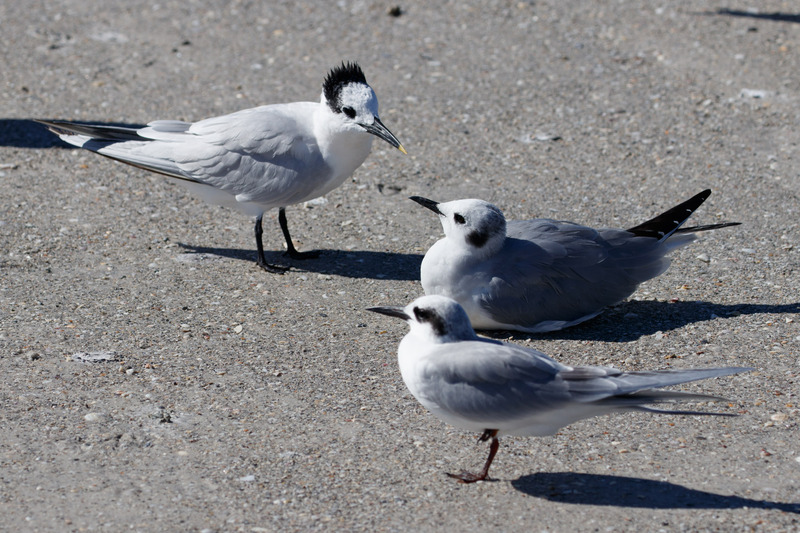 Towards the end of the week, while scanning terns I noticed an imposter next to the Forster’s Tern. The Sandwich Tern noticed too. That dark spot next to the eye is incomplete, then I noticed the leg color was different. That’s a nice gull from home! 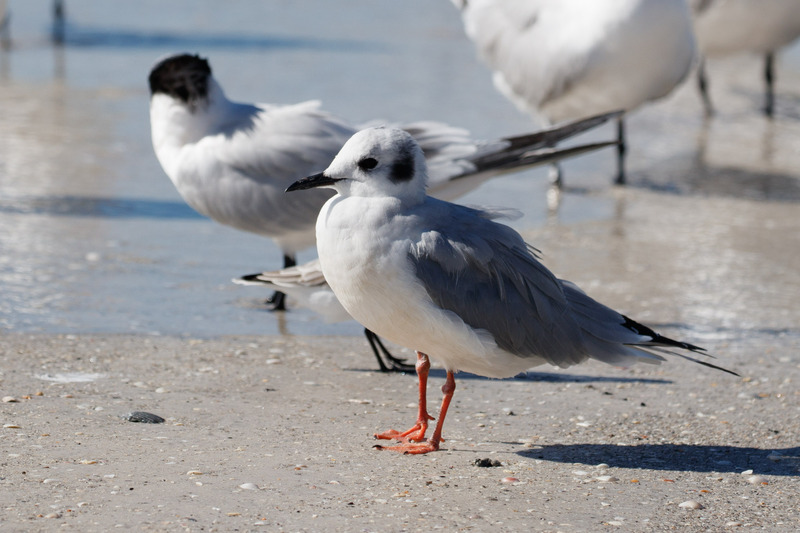 A Bonaparte’s Gull. I found a handful more the next day. On the last day at the condo, I walked out to check the birds for a final time, and as I scanned through, I noticed a gold eye in the mix. 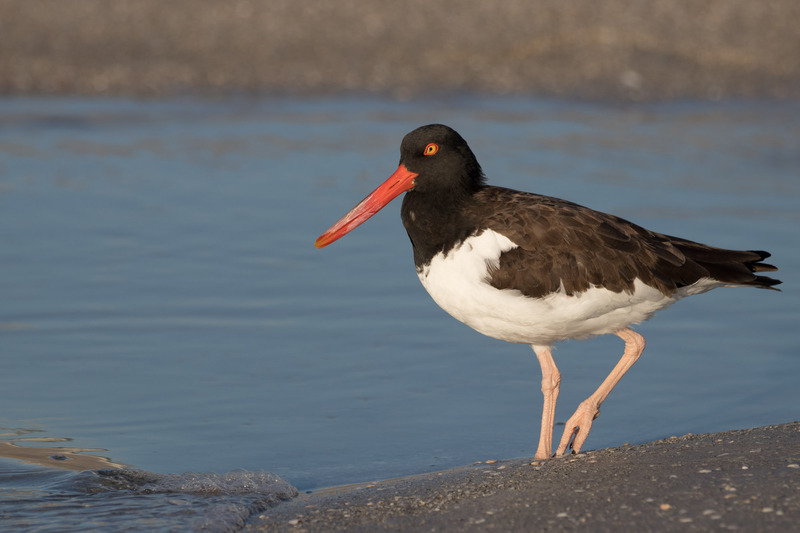 Oh yes, American Oystercatcher! My prior sightings of this species have always been so far away so it was nice to finally appreciate a close-up view of this one. Hey, there. 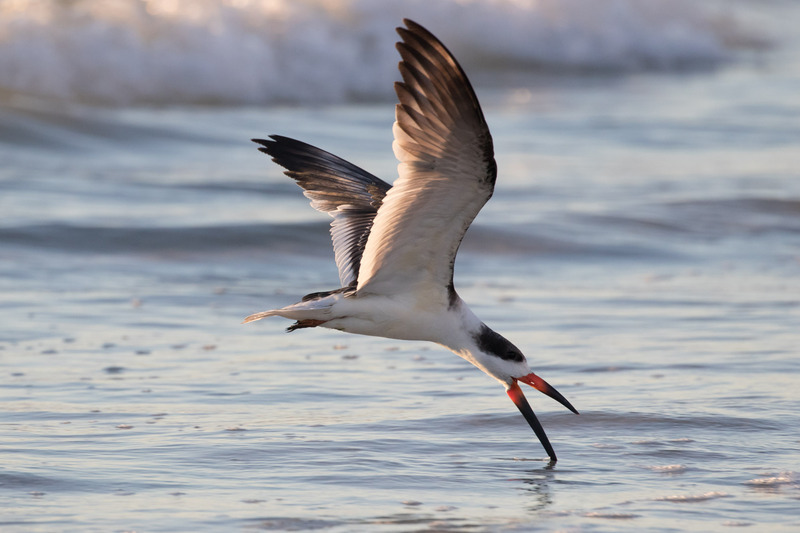 And the last evening on the beach the final show was put on by Black Skimmers skimming. I couldn’t believe my luck, it was the best of beach times. Heavy fog rolled in the next morning but it didn’t take long for the blazing sun to burn it off. 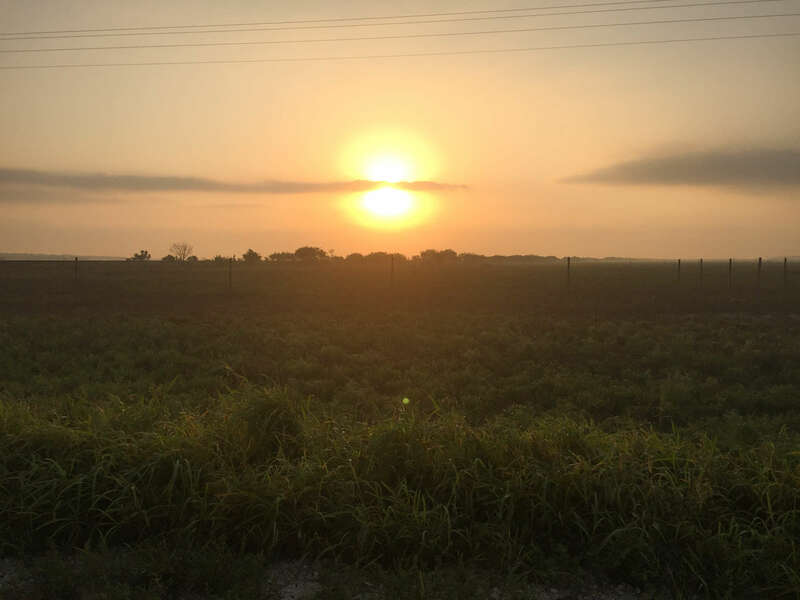 The Lower Rio Grande Valley is hot. Each day I dug deep to my Floridian roots, sucked it up, and birded through the thick wall of humidity and heat. While applying regular applications of sunscreen and bug spray. It’s easy to forget that trying daily routine from the (mostly) comfy Pacific NW. 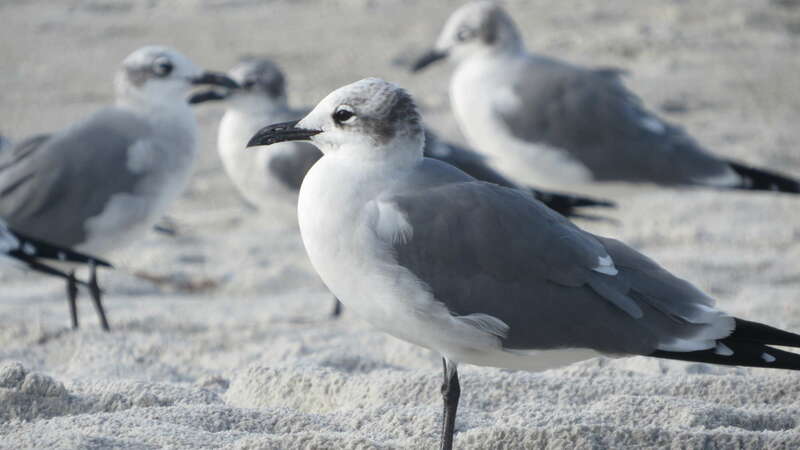 But of course the same reasons I’m repelled from the southeastern US are what attracts such a great diversity of birds. Heat and bugs. 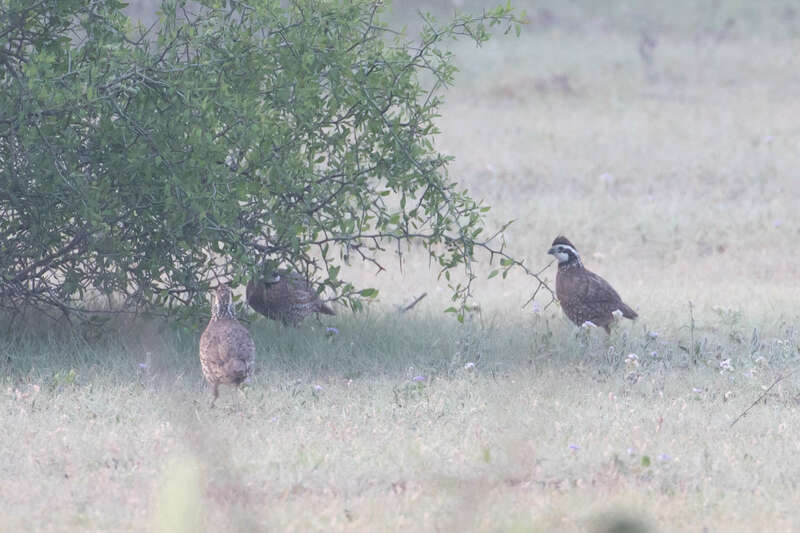 We had plenty of both at our next Texas hotspot, Old Port Isabel Road, seven miles of gravel road through lowland open grassland habitat. 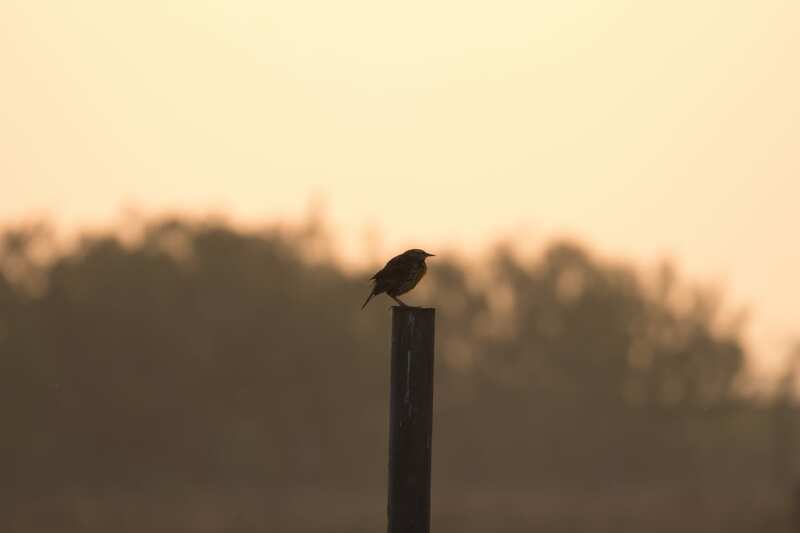 One of the first bird’s to greet us was the Eastern Meadowlark. I recognize that shape. 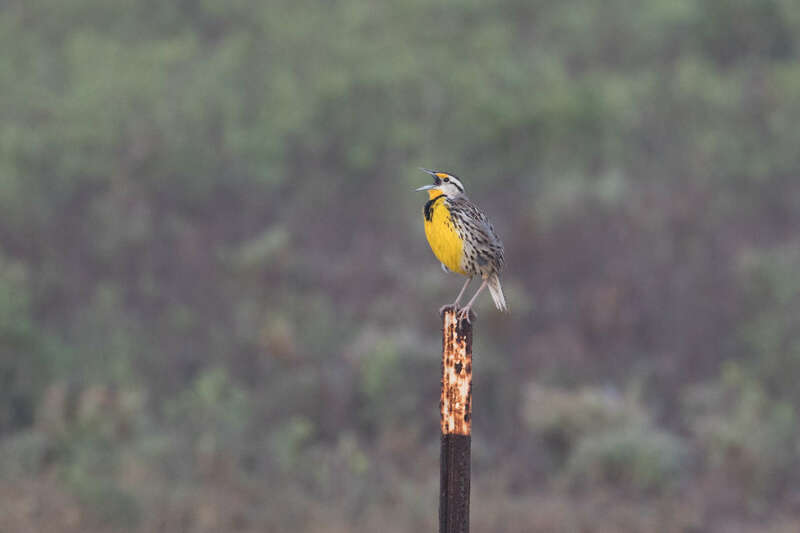 This meadowlark is best distinguished from the Western variety by song. Western: a rich, low, descending warble “sleep loo lidi lidijuvi.” Eastern: simple, clear, slurred whistles “seeeooaaa seeeeadoo” higher, clearer, with no gurgles (Sibley 2016). Shortly after we heard another tell-tale “Bob-white” call of the Northern Bobwhite! This was one of my most eagerly anticipated sightings. So cool. Even if they just ran away from us. 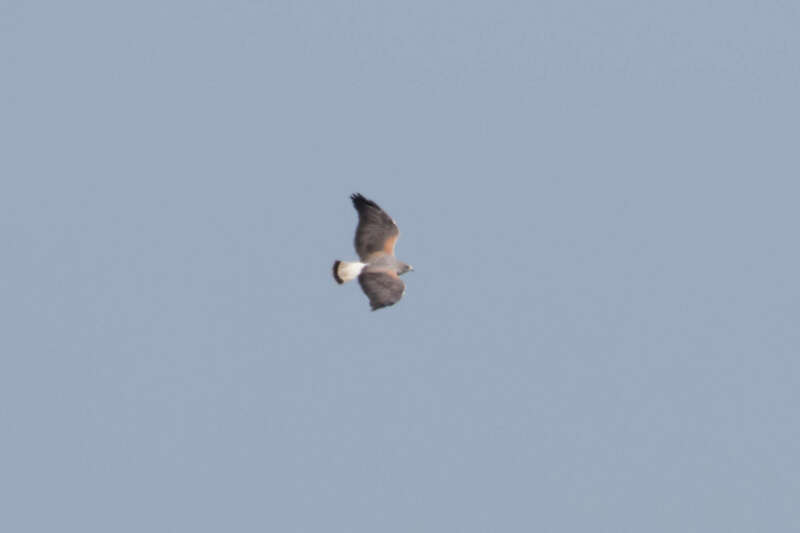 Then someone spotted a White-tailed Hawk far in the distance. Worst views ever so here’s a slightly less worse view from a later sighting. Clearly white-tailed. 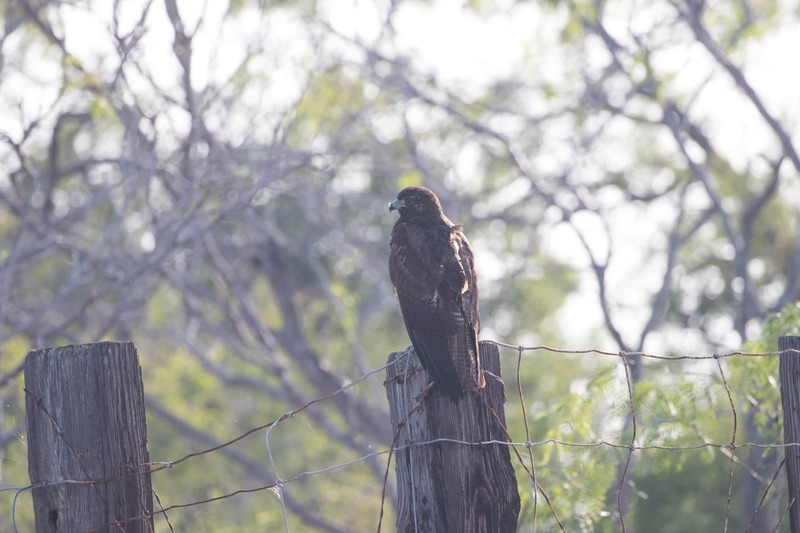 I should mention another hawk of Texas that should have been familiar but wasn’t. 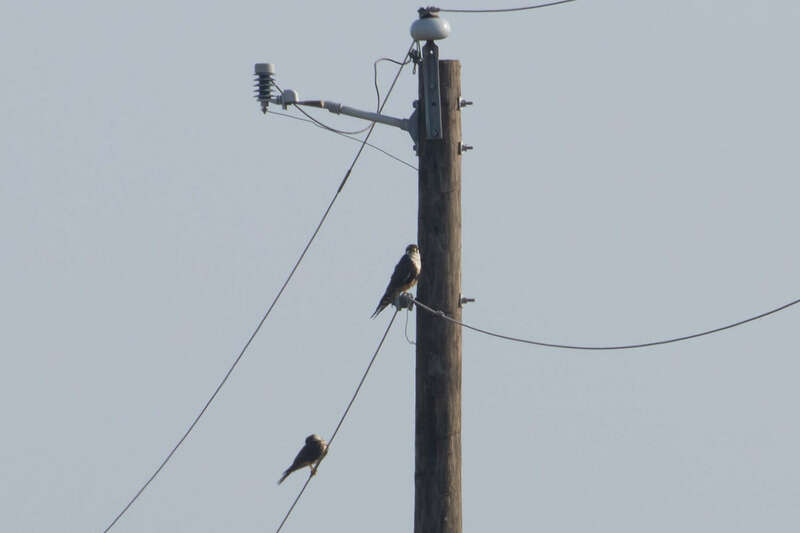 Red-tailed Hawks. Like the one below. Where are the patagial marks? It doesn’t match Eastern or Southwestern varieties in guidebooks. Leave it to red-tails to break the mold. Jerks. 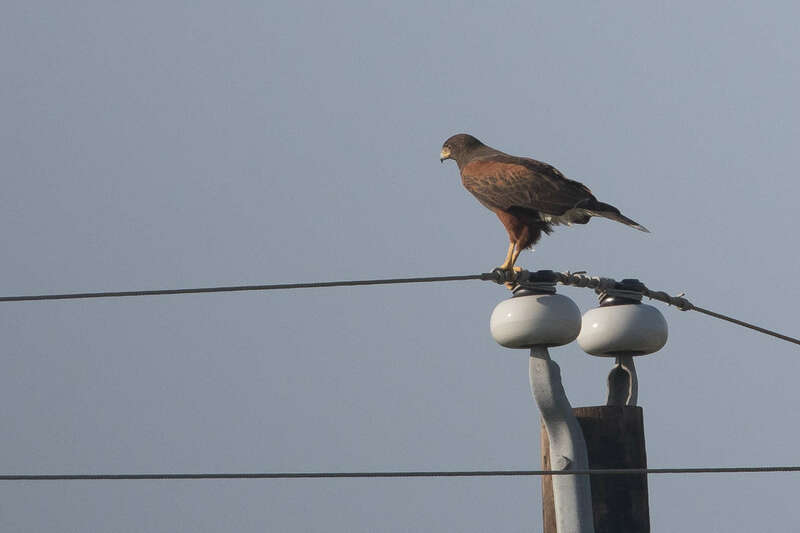 At least Harris’s Hawks follow the rules. And there were plenty of these along the road. 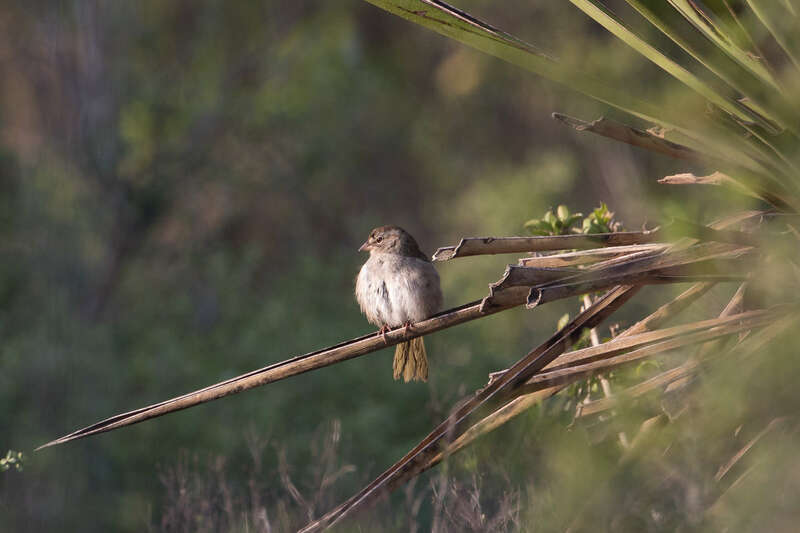 Not just raptors, there was also a fun new sparrow to ID, the Olive Sparrow. It has one of the greatest sparrow songs I’ve heard with a catchy bouncy-trill ending. Near the end of this road we all got a great surprise on a telephone pole. Mythical falcons seen only in guidebooks come to life. Aplomado Falcons! (Aplomado Spanish for “lead-colored”). Then they did what no birds ever do. They both flew directly towards us. 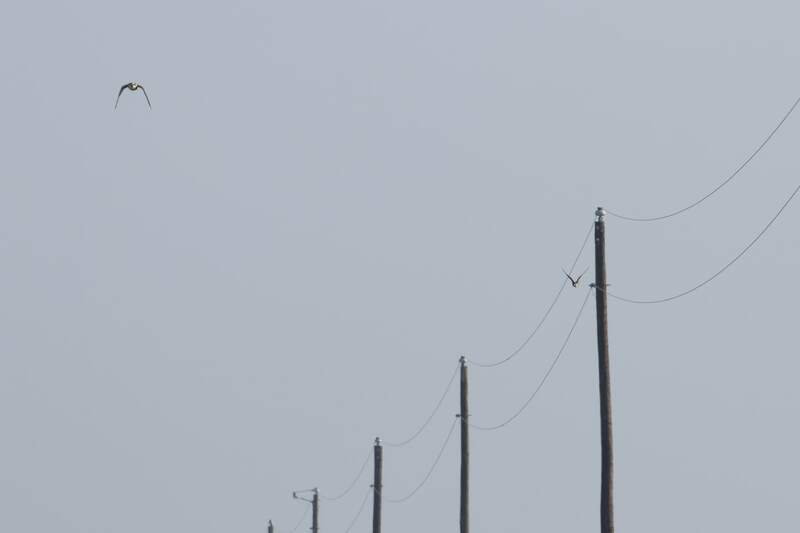 They passed us by at eye level flying incredibly fast and low over the prairie. 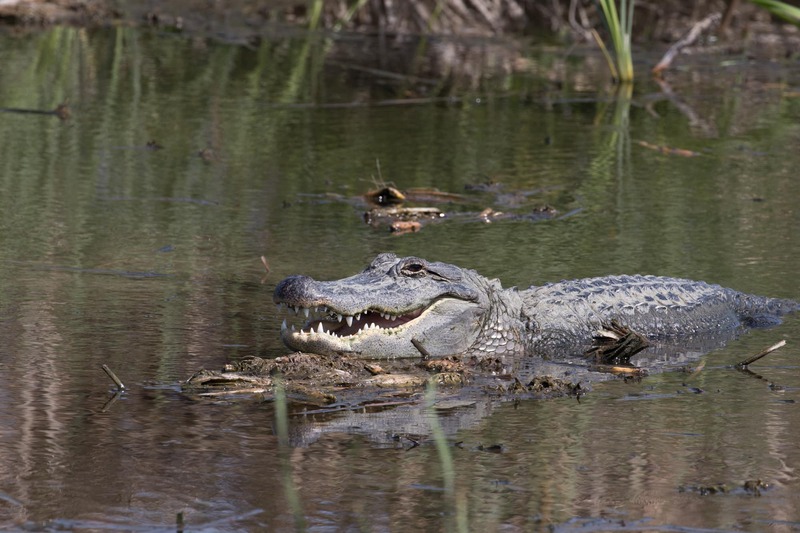 The last wild breeding pair was seen in New Mexico in 1952. 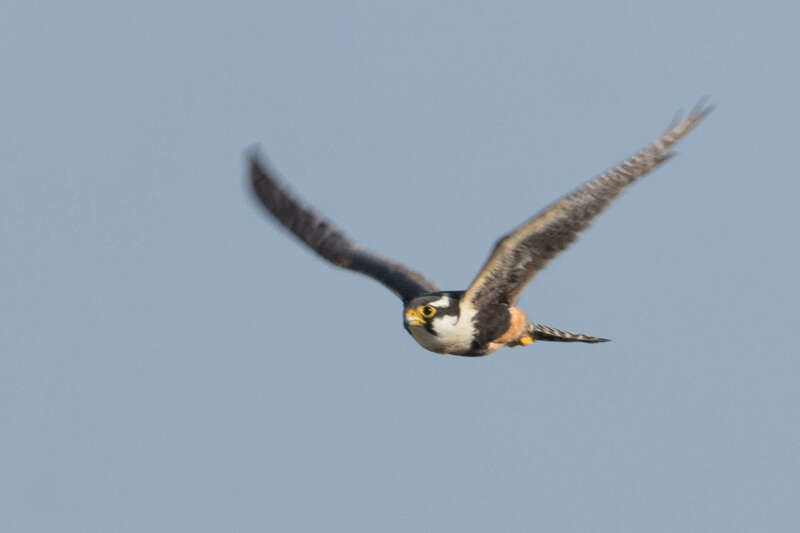 These that we saw are a result of a falcon-reintroduction program by the Peregrine Fund. 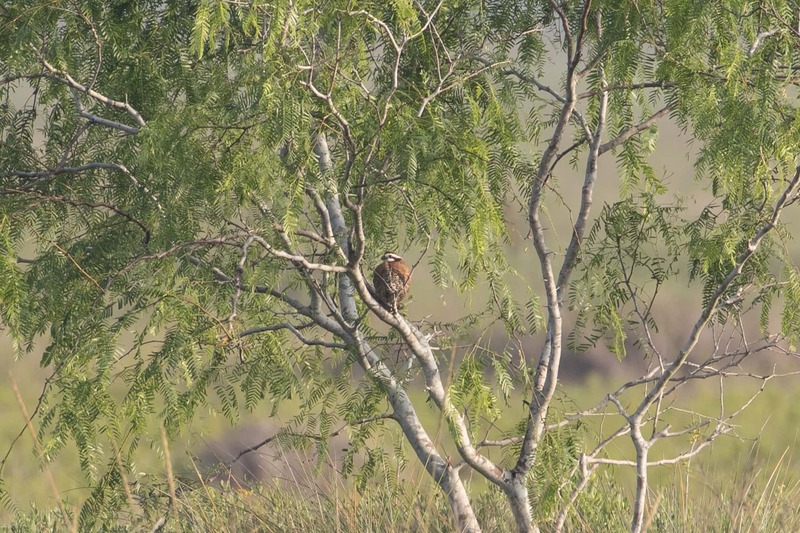 Thanks to predator-resistant nesting platforms and the release of 1,500 chicks (since the 80s) there is now a small breeding population in this part of Texas. I’m grateful because either way you count it, the falcons are amazing. And since it’s my 400th bird species they count extra for me. What happens after an Aplomado sighting? We could have ridden the high the rest of the day but it was still early. So we did the only thing we could do. We headed to South Padre Island for 0.99 beer bongs. Jk. We birded on. 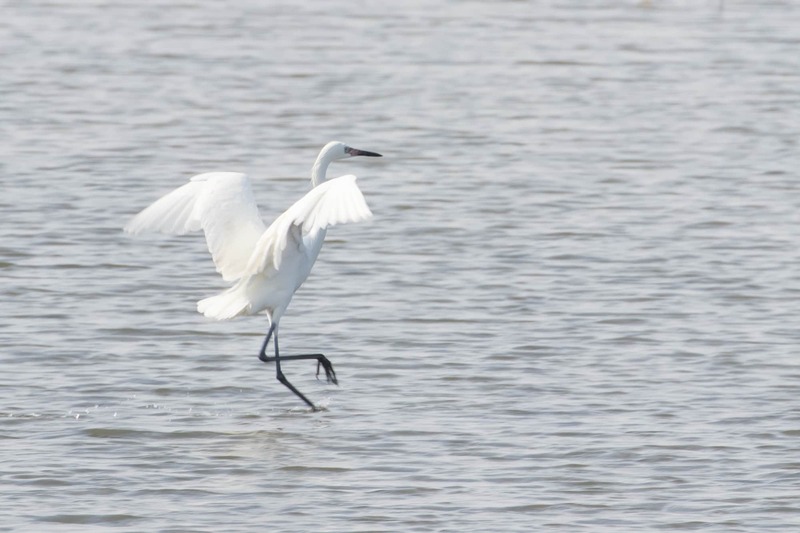 The afterparty started at the South Padre Island Birding and Nature Center where a white-morph Reddish Egret drunkenly danced in the tides. 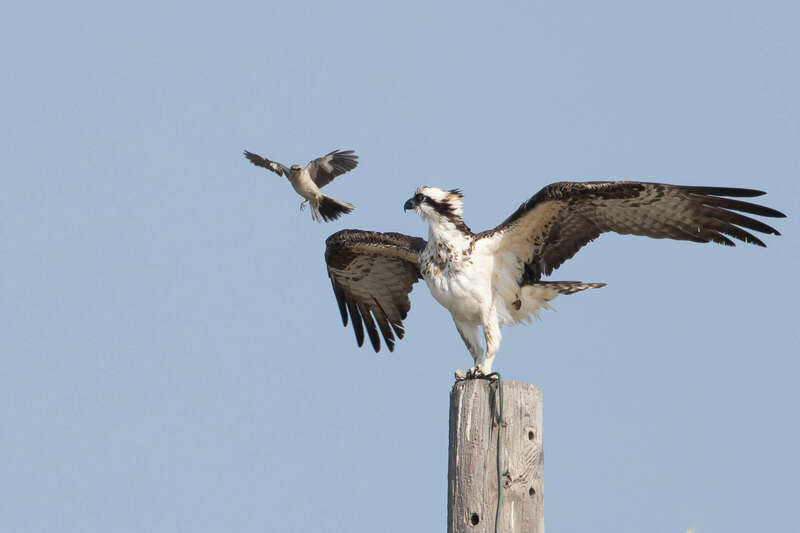 An Osprey danced with a Northern Mockingbird. 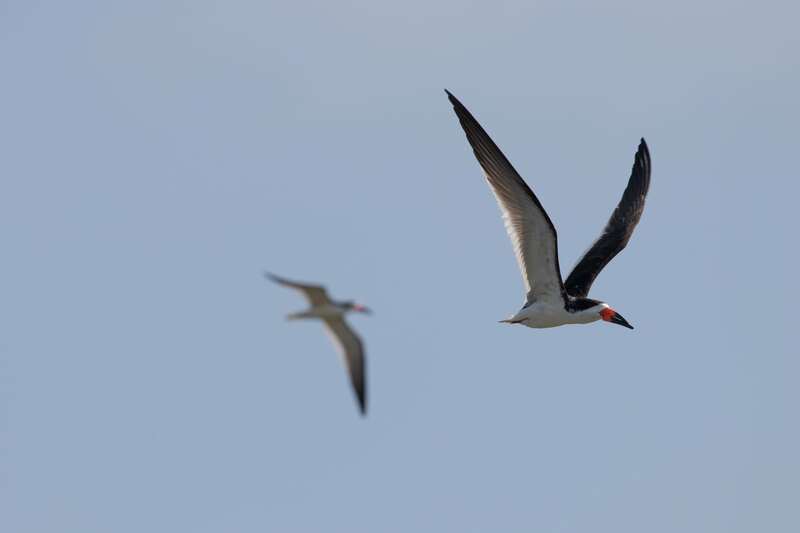 Black Skimmers danced in the sky. And gators sat stoned grinning in the corner. 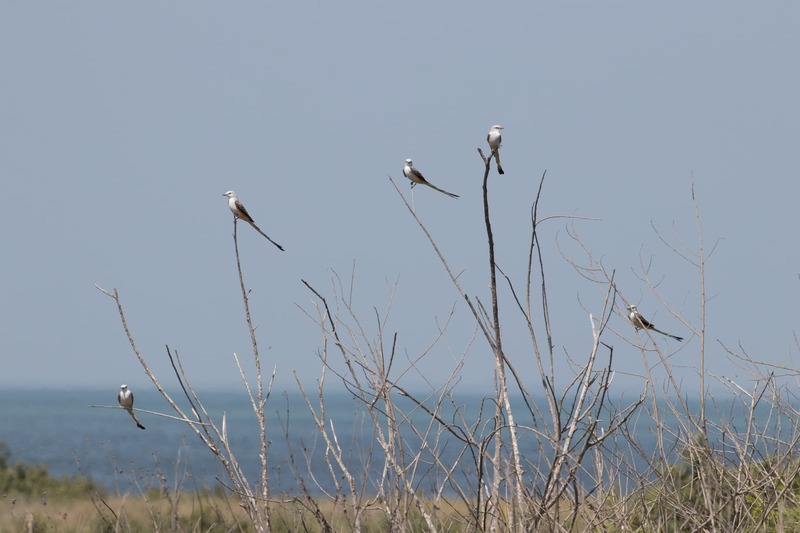 We also saw Scissor-tailed Flycatchers aka wallflowers. 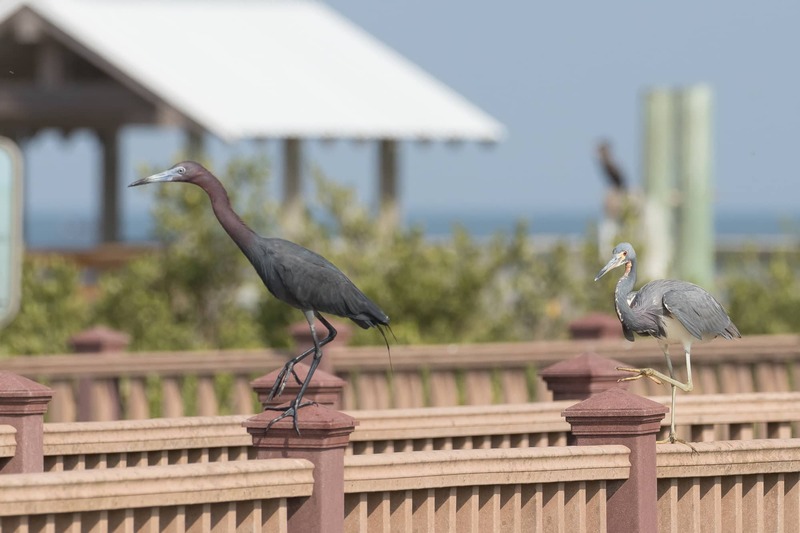 And Little Blue Heron and Tricolored Heron doing The Robot. It was good times. We took a break from partying and birded near a random boat ramp. 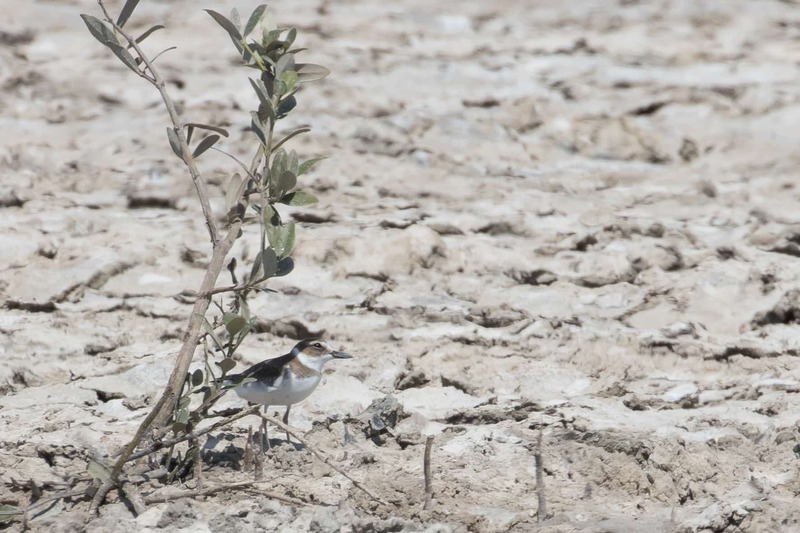 Among other shorebirds, we found a Wilson’s Plover under the only bit of shade around. Then there was time for one last stop. Mexico. Or at least up to the border. This took some confident driving skills by Jen. At least the tide was going out. Right? 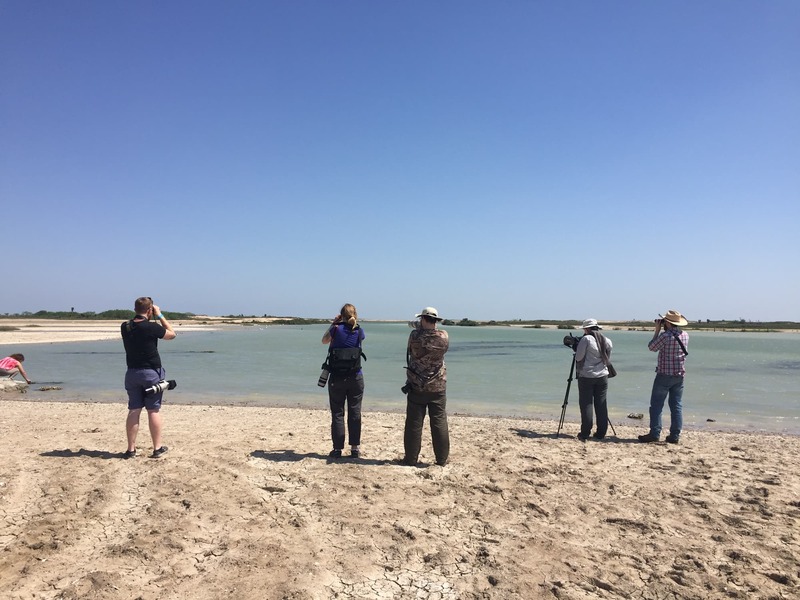 Then, before picking out birds in Mexico, finding a dead dolphin on the beach, laughing at cartoon crabs and watching Max catch a fish with his bare hands, we had the second most exciting bird encounter of the day. AJ yelled for us to look at the dark bird over the water! 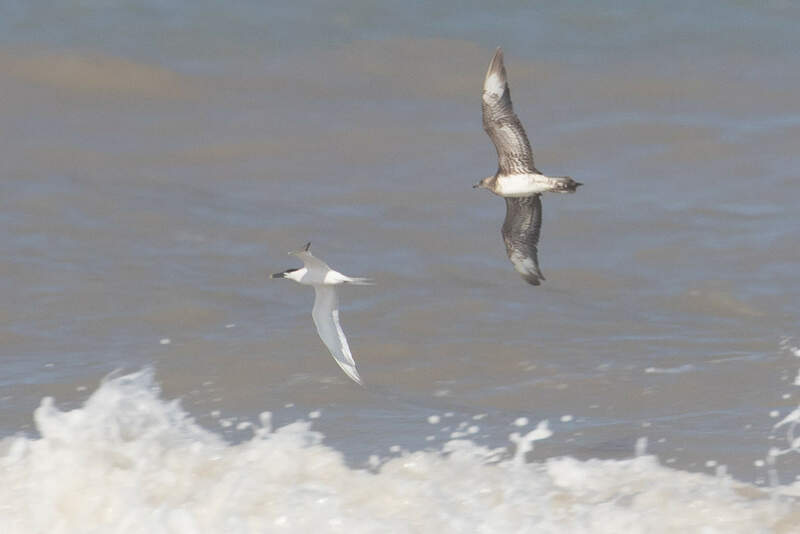 We all turned to see a Parasitic Jaeger chasing after a Sandwich Tern! But you can’t see jaegers from the shore?! 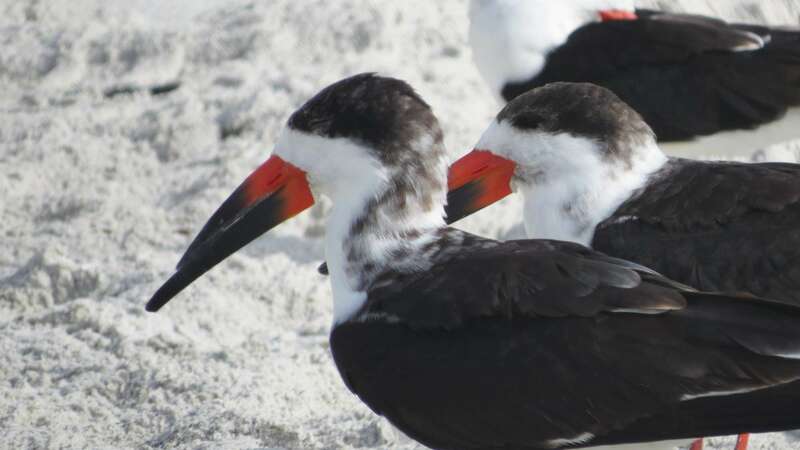 These are pelagic birds! You have to be seasick on a boat miles off shore to see them! Except when you’re in Texas. Aplomado to Jaeger in a day? The tropics are growing on me. 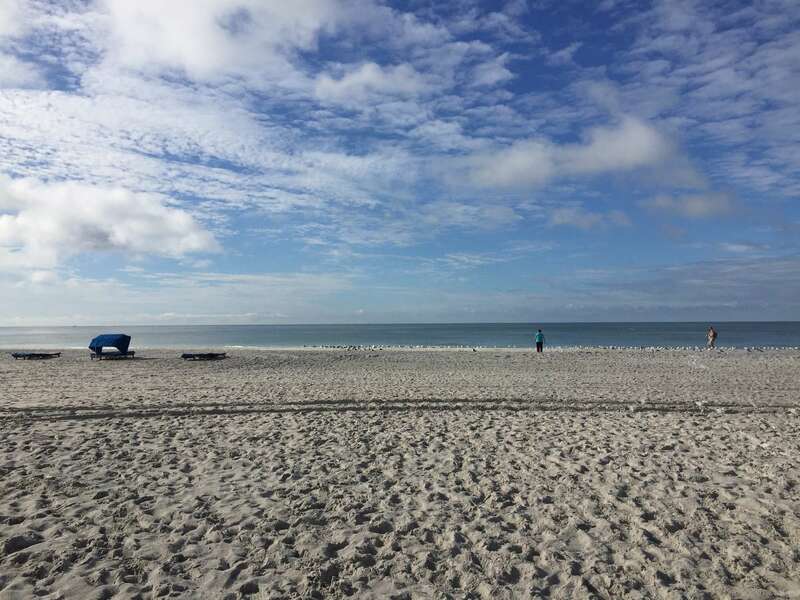 Madeira Beach will always have a special place in my heart. It’s where my family has always spent Thanksgiving. And this year it’s where I met one of my new favorite birds. I walked on to the beach and couldn’t believe my eyes. Or my luck. 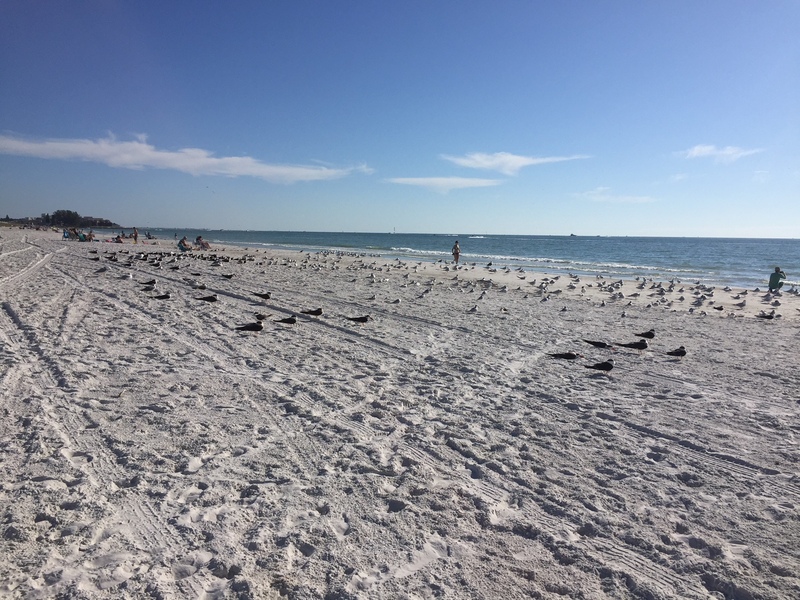 Among the people walking on the beach and the sunbathers was a huge flock of birds. Woah. 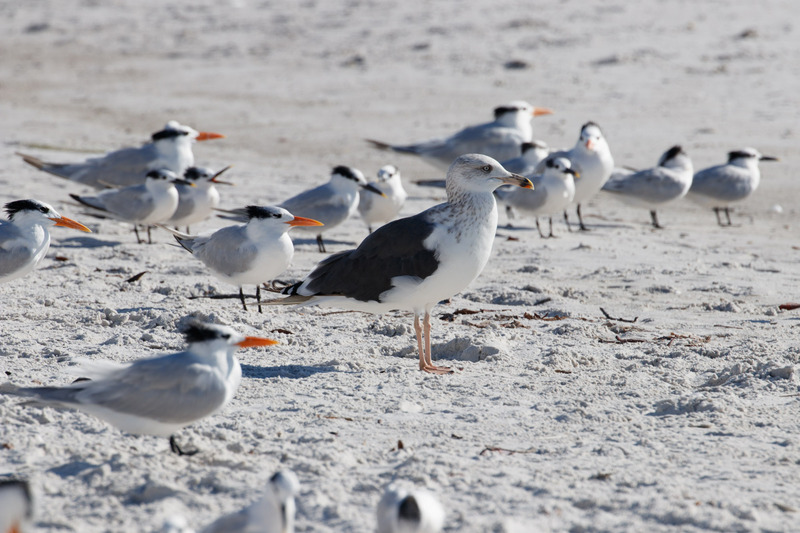 I started going through the categories and labeling the birds in my mind: gulls, terns, shorebirds…wait, What. Is. That. 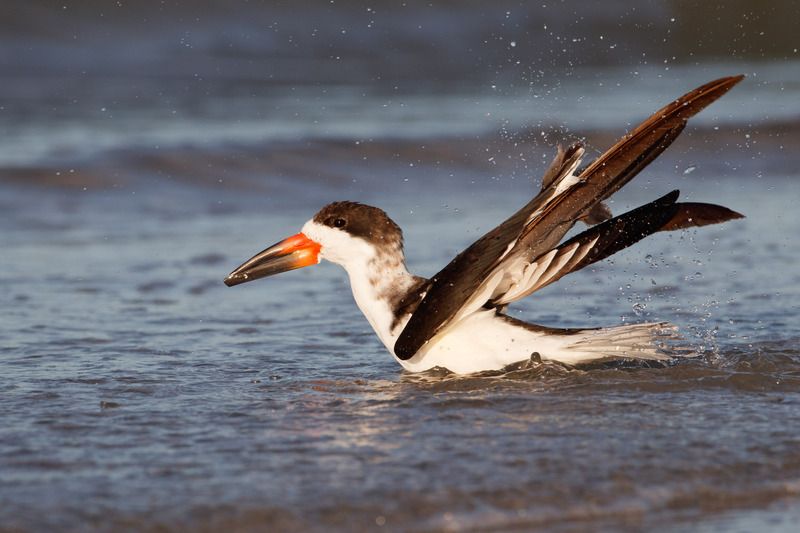 The Black Skimmer immediately short-circuited my brain with wonder and amazement and I fell in love. How hilarious is that face? These birds are fascinating. They use their elongated lower mandible to skim the water surface feeling for fish. The lower mandible doesn’t move, instead the top clamps down when they make contact with a fish. 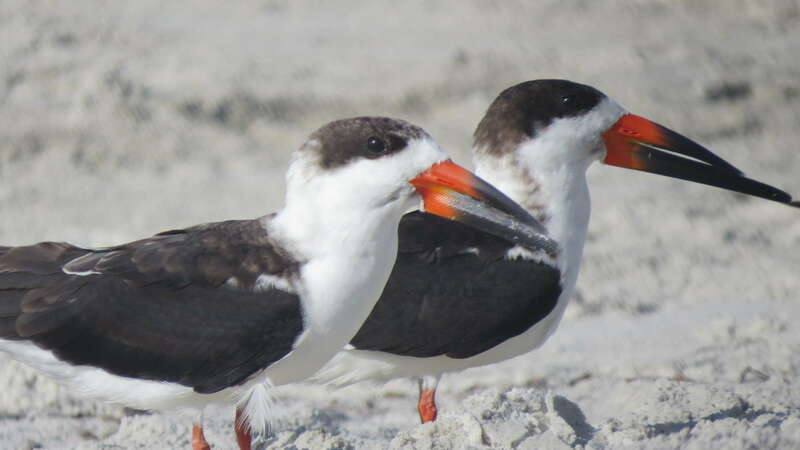 Black Skimmers are also the only bird with large pupils that narrow vertically into cat-like slits. This protects their eyes during the day from glare and reflection, and when opened, allows them to efficiently feed at night. Another charming characteristic of this creature is the way it rests. It lays on the sand and kind of looks like it’s dying. See the one in the upper right? I avoided taking many pictures of the birds “resting” since they looked kind of sad and depressing. Little did I know that is their normal behavior. 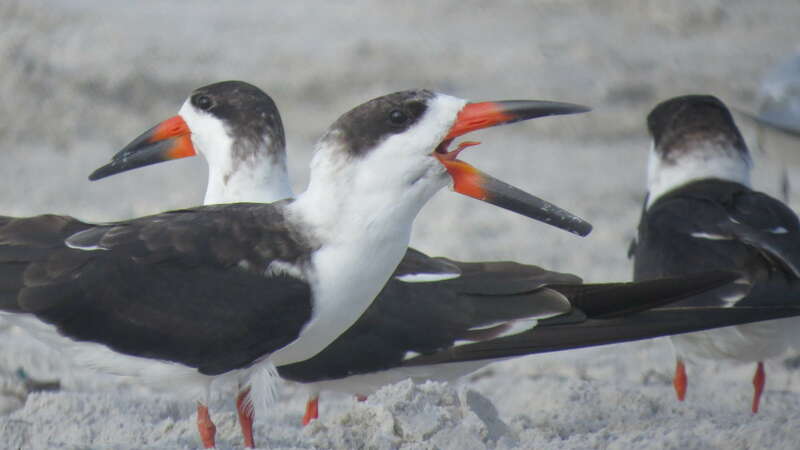 I could have watched the skimmers all day, but there were many more birds to see! Some species I recognized, since I’d recently seen them on the Crescent City coast in California, but I was happy for the refresher. 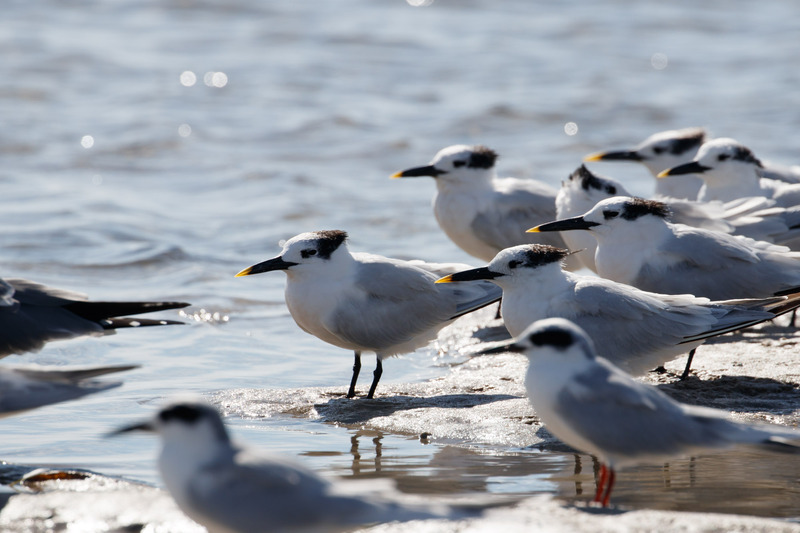 And there were new birds in the mix, like the Sandwich Tern! 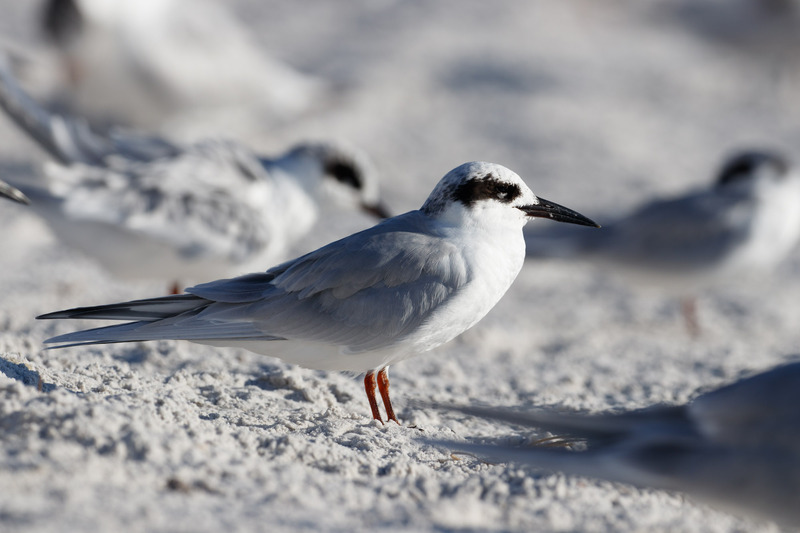 The yellow-tipped black bill distinguishes this tern. Thalasseus sandvicensis, (sand-vi-SEN-sis) is named after the “Sandwich Islands” (Hawaii), though the bird does not occur there. Hm. 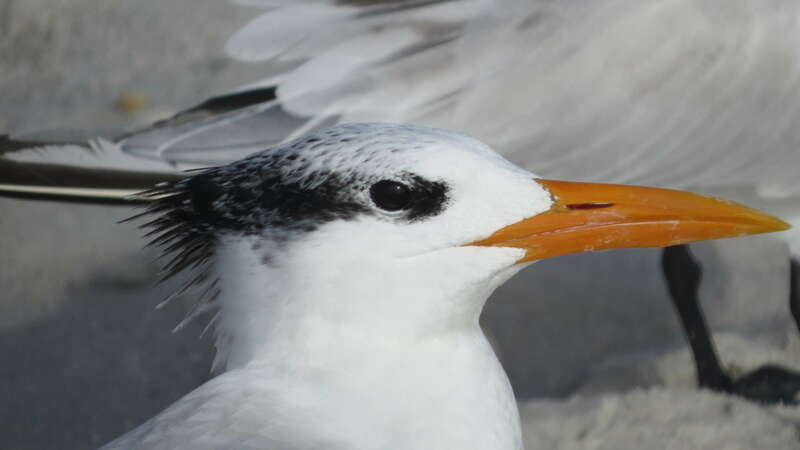 And the Royal Tern! 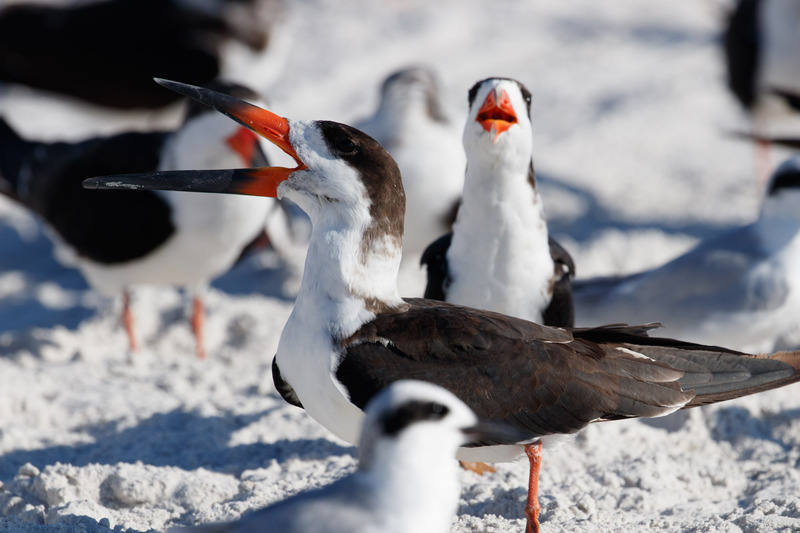 Not to be confused with the Elegant Terns I saw on the Pacific coast. 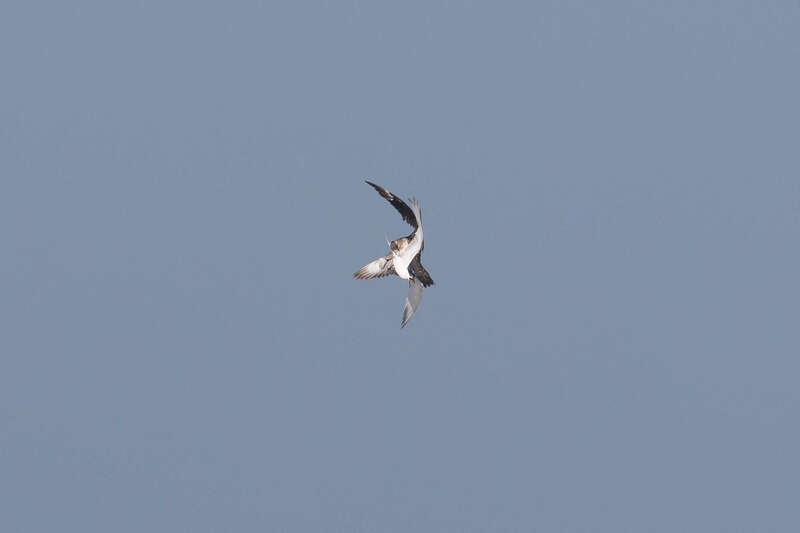 One tern I thoroughly enjoyed watching catch fish was the Forster’s Tern. It soared gracefully over the water before diving like a missile, then *bam* it would break through the water surface, often returning with a fishy reward. 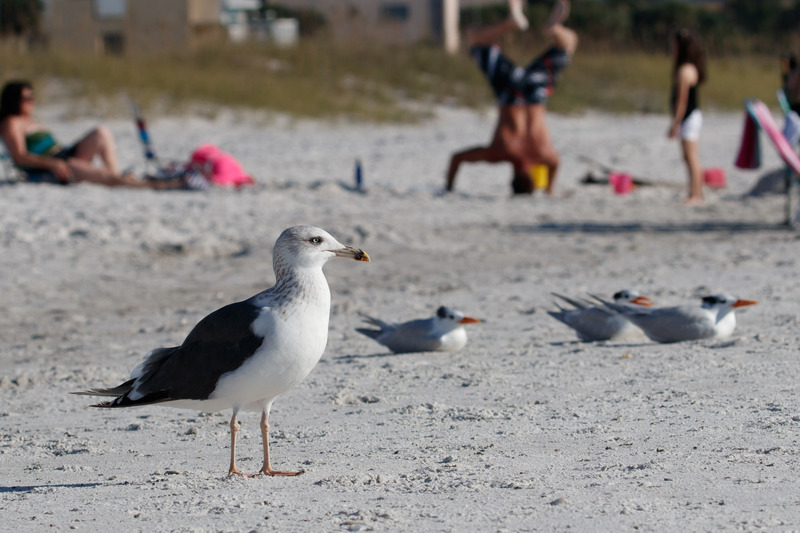 I saw a familiar gull, the Ring-billed Gull. 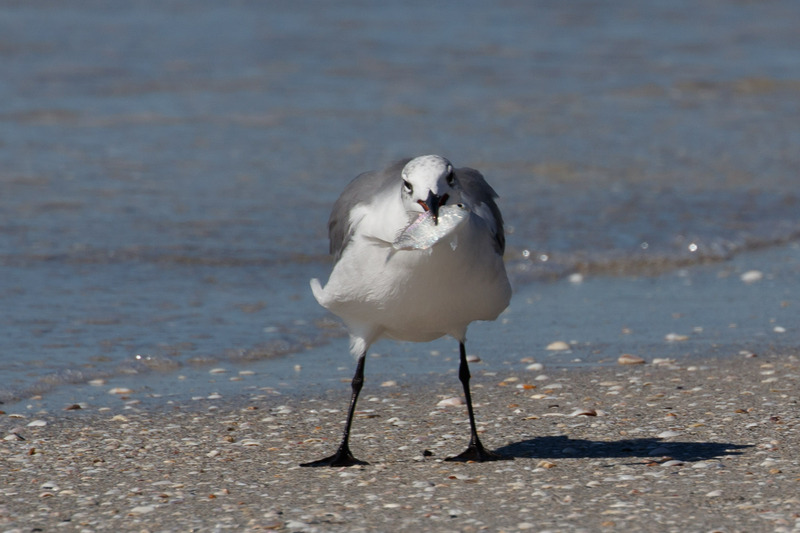 And a new gull, the Laughing Gull! 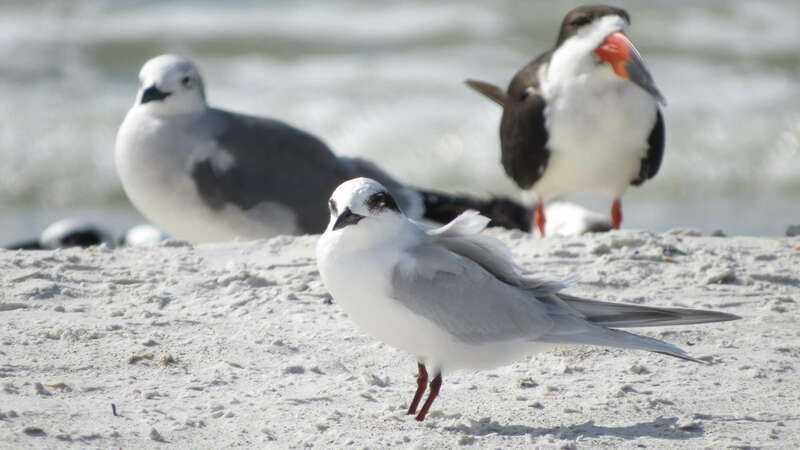 Named after its laughing call, and according to the ABA Field Guide to Birds of Florida, (and other sources because I couldn’t believe it), it is the only gull that breeds in Florida. It’s pretty recognizable, even in winter plumage, with it’s white eye-crescents. I’d love to see them in their handsome breeding plumage. One significant little brown bird in the mix I almost overlooked was the Red Knot. 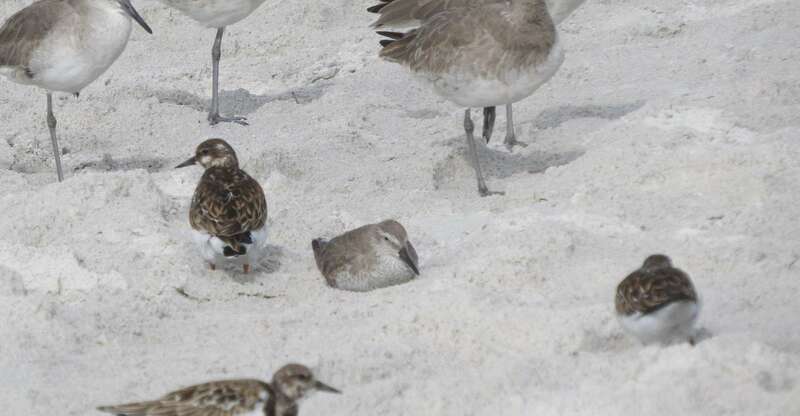 I didn’t notice it at the time, blending in with the other shorebirds, but there is one little knot laying in the sand between three Ruddy Turnstones. 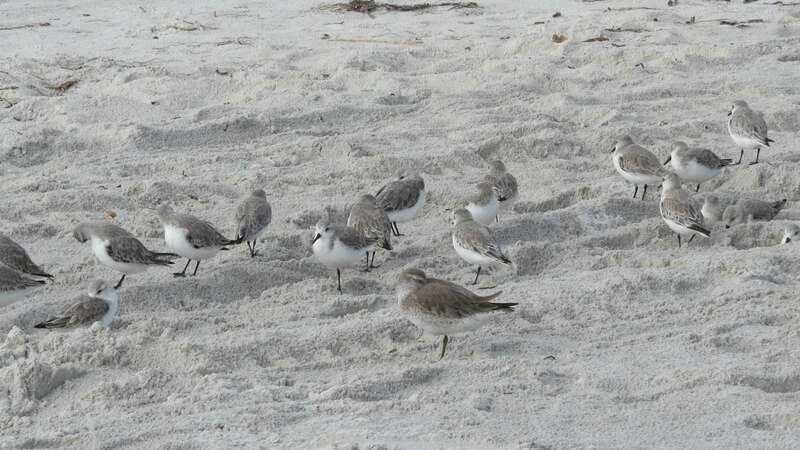 After searching through my photos, I found another picture of the knot pretending to be a Sanderling (it’s there in the front-center). 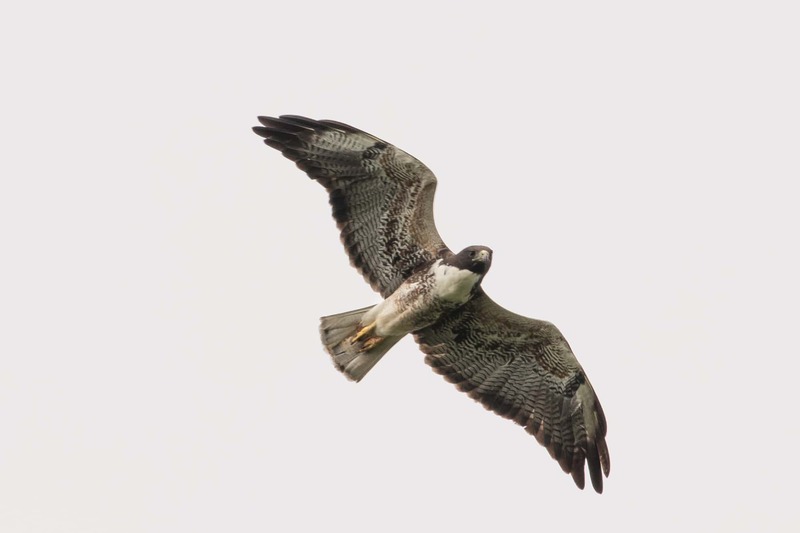 Though it’s bill is tucked, in this photo, the distinctive gray chevrons of its non-breeding plumage are more visible on its flanks. Reading up on the Red Knot, I realize this inconspicuous bird deserves a bit of recognition (probably its own post, but I’ll go on a Red Knot tangent instead). First, this small sandpiper makes an impressive yearly migration of 9,300 miles! Secondly, the eastern population has plummeted since the 90s due to overharvesting of horseshoe crabs at one of its migration stopping points, Deleware Bay, New Jersey. Much of the critical habitat was also damaged after Hurricane Sandy in 2012, but restoration efforts thanks to the American Littoral Society and Conserve Wildlife Foundation of New Jersey have improved the site and this November they even held a dedication of Oyster Reef to veterans in order to connect the community to the ecology. 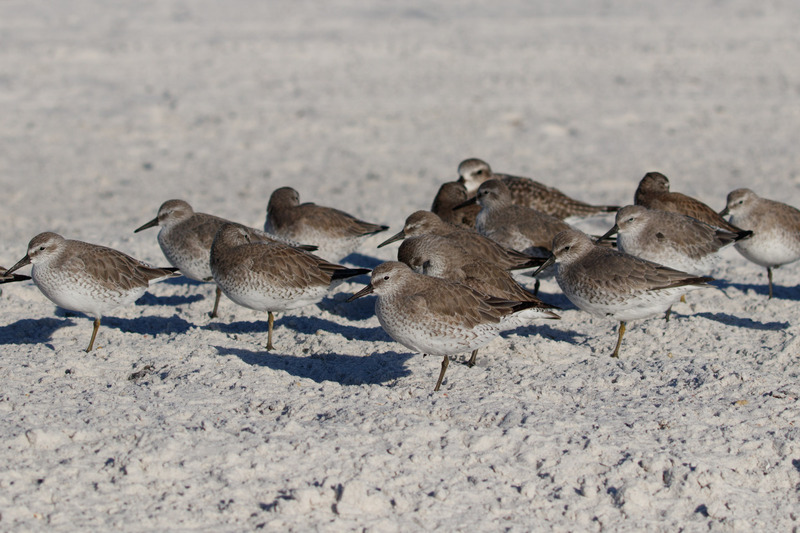 Partnerships like that will keep the Red Knots rich in horseshoe crab eggs. I’m hopeful anyways. 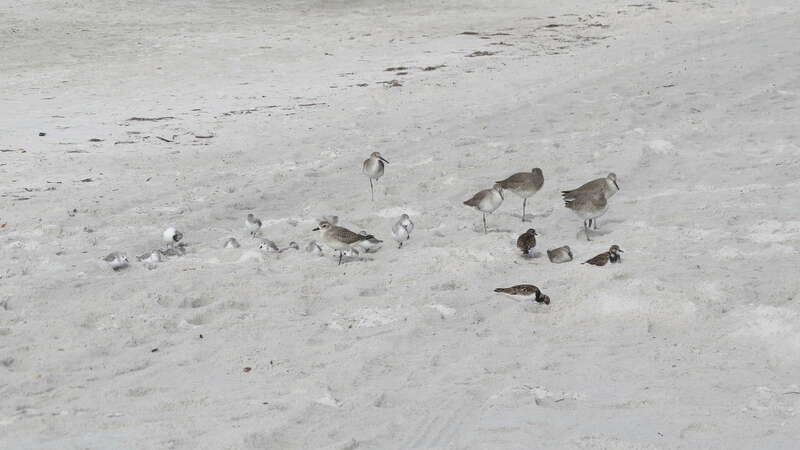 Off the Jersey Shore and back onto Madeira beach, I saw Willets! And my new catchphrase was born. 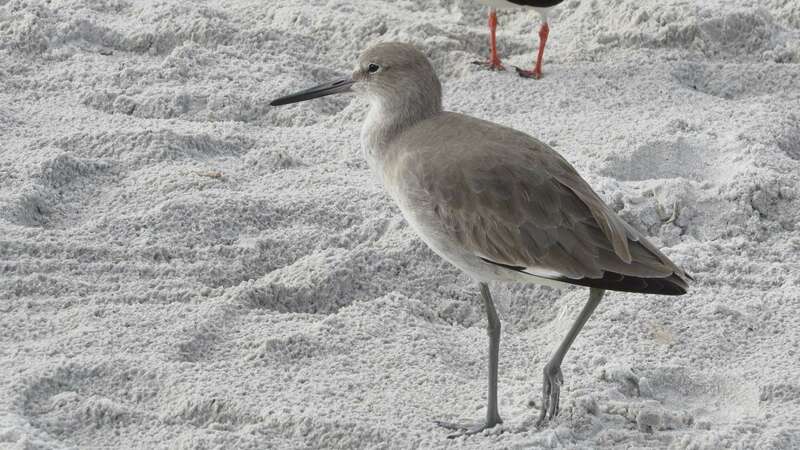 Willet, or Won’t it? Hah. Who knew a brown shorebird could be so photogenic. Gorgeous! All in all, it was a great day at the beach! I spent the rest of my time sunbathing, working on my tan, and lying around. Just kidding. Sgt. 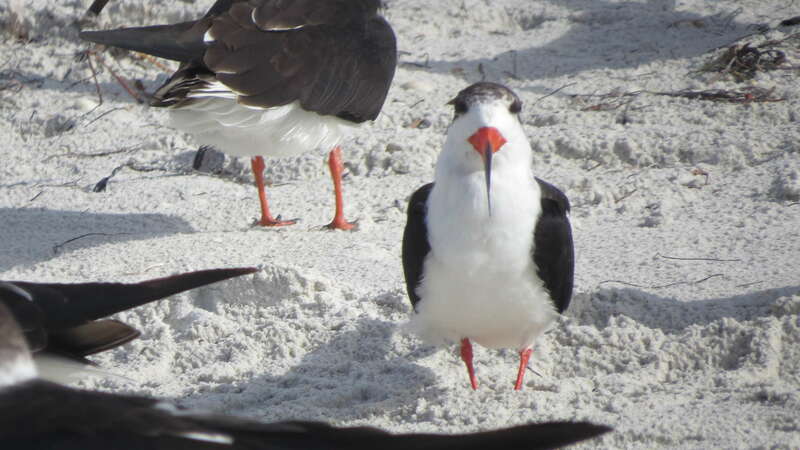 Skimmer says wear sunscreen! Stay hydrated! Get in the shade!